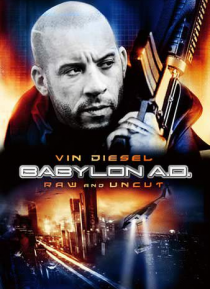 Get even more sci-fi action in this unrated extended edition of BABYLON A.D.! In the darkly futuristic world of Babylon A.D., the rules are simple: kill or be killed. Hard-hitting action superstar Vin Diesel stars as Toorop, a ruthless mercenary hired to smuggle a mysterious young woman from the post-apocalyptic confines of Eastern Europe to the glittering megalopolis of New York City. Hunted at e… very turn, Toorop spirits his charge across a nightmarish wasteland only to uncover a shocking secret that will bring the entire world to its knees. Eye-popping action and mind-blowing science fiction clash head-on in this hard-edged thriller, where the only rule is survival.